In recent years, you could always find a few areas of the market that were soaring... even if the overall pace was slow. That wasn't the case last year. And one of the most disappointing corners of the market for investors was financials. The financial sector tallied one of 2018's largest losses... down 13%. But things have changed to start the new year. Financials rallied in a way that has only happened one other time over the past three decades. It was a rare event. And it means this loser from last year will likely be a big winner in 2019. It's always worth paying attention to rare momentum events. They generally kick off longer-term moves higher. And history says that's likely the case with financial stocks right now. Again, financial stocks ended 2018 with major losses. But they bounced back with force in January. The sector started 2019 with a bang, rising in 12 of the first 13 trading days of the year. That run included a string of 11 straight positive days. That has happened just one other time since 1992. It's an incredibly rare occurrence. But it's also incredibly powerful. History says double-digit gains are possible after this momentum event. The overall market bottomed swiftly in late December. We've seen a major rally in stocks since then – and financial stocks have led the way. The sector is up 16% from its December low, after January's meteoric rise. But that doesn't mean we've missed the rally. History says we still have plenty of upside left. Financials have performed well over the last three decades... returning about 7% a year. But buying after similar momentum events leads to much better returns. Similar instances have led to 6% gains in six months, 10% gains over the next year, and 23% gains over the next two years. Those are impressive returns... And they point to a big opportunity in this sector now. Importantly, the overall market continues to perform well. Stocks around the globe are bouncing back. That means the general environment is positive... And it could be an additional tailwind for a sector primed to soar, like financials. If you're interested in taking advantage of this opportunity, you can do it with the Financial Select Sector SPDR Fund (XLF). This is a simple fund that tracks the financial sector. It's an easy way to invest in America's biggest banks and financial institutions. 2018 was a rough year for most investments, especially financials. Don't expect that to continue this year. 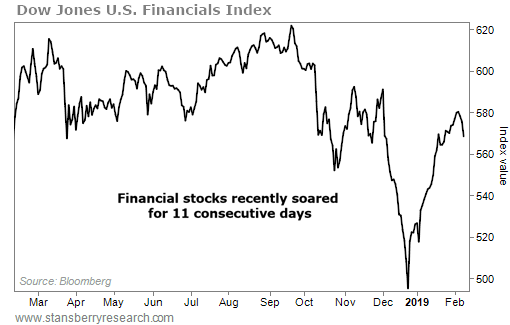 We just saw a rare string of up days... And history says big gains are on the way for the financial sector in 2019. "Stocks around the world have rallied in January," Brett writes. "But you'd be hard-pressed to find any global stock market hitting multi-month highs today... with one big exception." Learn more about this surprising market here: Double-Digit Upside in One of the World's Few Strong Markets. "If you want to know how investors really feel, look at what they're doing with their money," Brett says. Learn more about a recent event not seen since 2008 – and what it could mean for stocks in 2019 – right here.